At a typical baby expo, each business has a designated space. Vendors are usually are provided a table, a chair or two, and maybe an electrical outlet. The organizers may also put up a small sign with the business name at the back of the booth. Beyond what is provided, it is up to you to make your booth a place that people want to come and visit. One way to get ideas is to go to some fairs and find booths that are busy. Figure out what's working for them. Why are people attracted to their booths? You may notice that many exhibitors have their table at the front of the booth, right up to the aisle where people are walking. The exhibitor may have some items displayed on the table, perhaps some brochures, and they're sitting at the table, available to talk to the people passing by. Most of the time, what happens? People keep walking. Especially if it is crowded. Put your tables against the back of the booth and/or along the sides of the booth so people have to walk into it to see what you've got. Set up a couple of chairs so people can come in and sit down. Bring in a rug to warm up your space. In a conference center, the floor is typically concrete. Make a space where little ones can sit and color or do some kind of activity while you speak to their parents. Add a plant or some flowers to brighten up your booth. Make your table visually attractive. Use color with a pretty tablecloth and prop up your materials with little easels or little risers so people's eyes can travel across and up and own your table. Avoid having a flat landscape on your table. 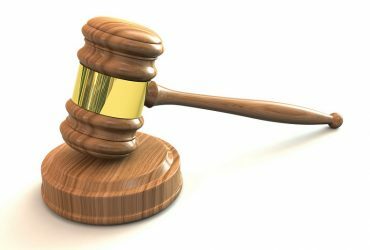 You'll also need to have some eye-catching visual aids to get people's attention and draw them into your booth. Many birth pros will have some of these props just lying around! A large banner to hang up, where people can see it from across the room. Props for demonstrations - Birth ball, pelvis model, posters, rebozos, baby slings with a doll or real baby! With the props, you might put the large items, like the birth ball, toward the front of the booth, close enough to people walking by to have to watch out for it. That'll get their attention! 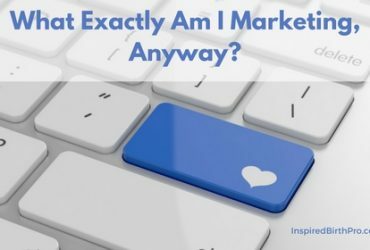 A video playing on a laptop, talking about what you do or featuring video testimonials. I have just returned from a local hospital's Baby Fair, and in seven years of sitting at tables promoting childbirth classes, this by far was my best fair. Here's what I did: pushed the table back and added a visitor chair, brought a stool for myself, took a birth ball and added birth related stuff to the table. But, the single biggest thing that I can attribute the success of this fair to is my professional Hypnobabies sign. People actually stopped and said "Enjoy your baby's birth?! Really?!". I used an inexpensive coat rack with wheels to hang the sign from and the large Hypnobabies logo really caught people's eyes. I put the sign behind the table, rather than hanging it in the front, which is what most people do. Not everyone stopped, but many did. I had several nursing students stop by, and the nursing instructor will be contacting me to discuss Hypnobabies with her class. What an opportunity to shape the future! I gave out packets of information to those who stopped and were interested enough to have a conversation with me and give me their contact information. Nicole King of Adventures in Childbirth suggests having someone else there to help talk to visitors, which especially comes in handy if you want to network with other vendors or are speaking with a prospective client. In addition, a good way to reduce your costs of having a booth is to get together with other birth professionals. You can split the cost of the booth, have someone there to give you a break when necessary, and it's nice to have somebody there to keep you company and even get to know better. I plan to join with a local massage therapist of chiropractor. That way people are willing to linger a bit for a massage. You can talk while they wait, or after they are in massage hangover mode. Massage therapist is excited because it will also help her target a specific group. Packets of more detailed information in case you've been hired on the spot! ***IMPORTANT*** - Be sure to have a sign-up sheet and collect their name, email address and phone number so you can email them a free gift (ie: checklist, recipe, helpful tips or article) or do a follow-up call in a few days. If you are adding them to your mailing list, be sure you get their express permission. People get VERY annoyed when they receive unsolicited emails. Something for the kiddos like stickers or a coloring pageUseful items that are personalized with your logo or business name. How many pens do you have with business names on them? Bribe 'em with chocolate. Not really, but it's nice to have a bowl with something sweet to eat available. Another way to collect email addresses is to do a drawing for something cool and useful. On the slip, be sure to have a check box so they can choose to add themselves to your mailing list. You can send everyone else a free digital gift as well. Create some goodie bags, filled with freebie products you've gathered, some candy, and some of your marketing materials. Be mindful that people who attend these fairs will get a slew of paper from a zillion vendors, and that it's highly likely these will end up in their recycle bin or the trash. To make sure your name sticks around with them, consider purchasing some useful, personalized products to giveaways. Some things to consider might be pens, a magnetic business card with some handy information about birth or breastfeeding, a stress ball, or a hand held massage tool. You can help out your birth professional community and spread the word about birth and services for women by offering to advertise for other businesses for a small fee. This takes some time and coordination, but it can help you in a few ways. 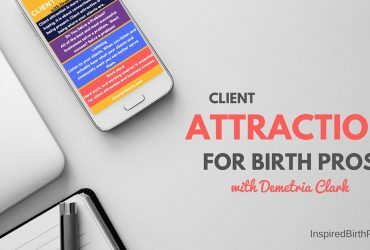 What you'll do is to send an offer to your network of fellow birth professionals. What they do is pay you a small fee and deliver to you a specified number of flyers, brochures or samples. You then put together goody bags that you can give away to people who visit your booth. You could also waive the fee if they give you a door prize to give away! Doing something like this can help to offset the costs of your booth and also help your community of birth professionals! 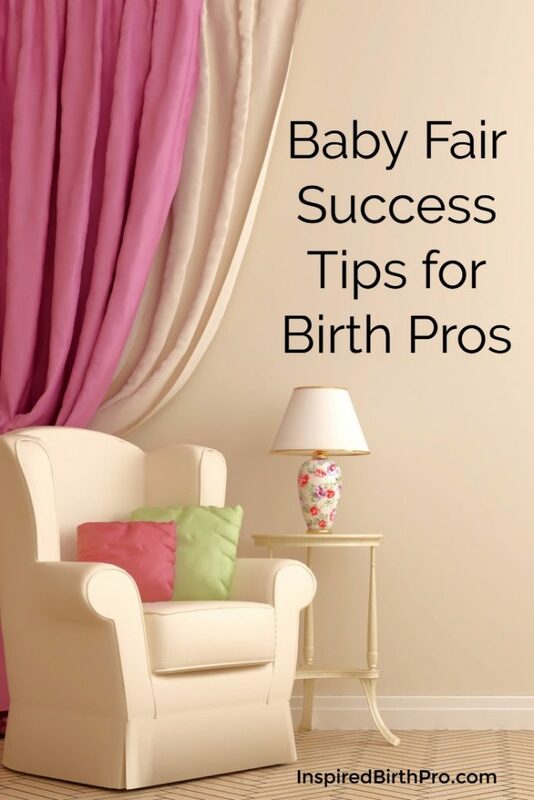 These tips and tricks will help you look professional and attract people to your booth at any Baby Fair. If you have any tips to share, we'd love to hear them too! And, if you have a successful experience using some of the tips we've provided, please brag about it in the comments or join the Inspired Birth Pros Facebook Group! You'll encourage many more birth pros to get out and be more visible in their communities. I love this. We just finished a whole week at our county fair and found that people just walked by. But we did do a giveaway to collect names/ information. We had our tables to the sides as well and it helped I think. Next year we need something to draw people in–like free chair massages or something. I love your website, by the way. SO helpful!